Chosen Subject: The gluttonous, gruyère-cloaked, onion ring–topped objet d’art made famous at Southeast Portland’s Slow Bar, plus other burgers, onion rings, and fries served in a snug, retro-style diner. 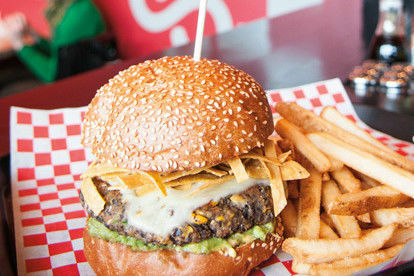 Stuff Your Face: Brioche-bunned burgers, meaty and monstrous. But the real surprise the genuinely great veggie burger: a creamy-yet-chunky black bean and roasted corn patty stacked with avocado, pepper jack cheese, spicy mayo, and crunchy tortilla bits. Be Warned: Sliders are often overcooked and precariously tall, thanks to their laundry list of toppings. Stick with the heftier patties.